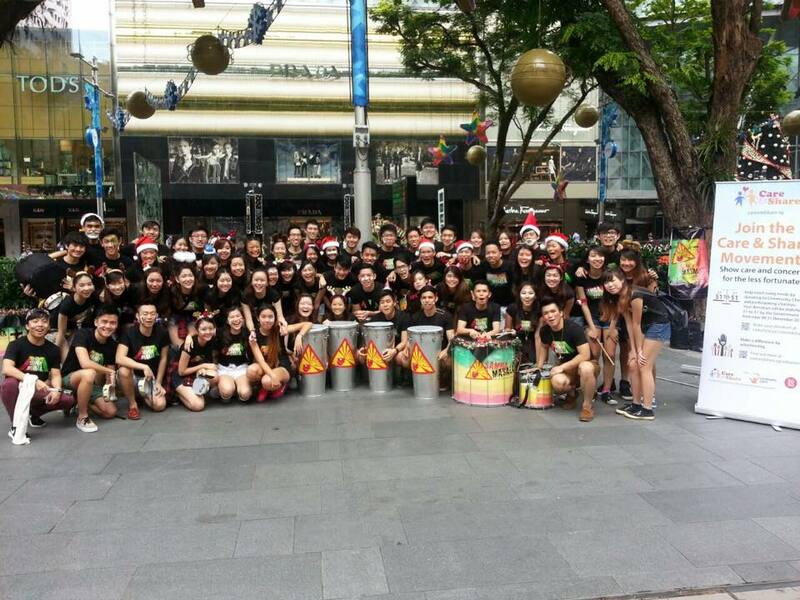 This Christmas season Samba Masala manages to wrap up the busking sessions with the giving spirit. We raised a total of $1382.90 for Singapore Community Chest, 100% of which will be going towards beneficiaries as the Community Chests' costs are covered by Singapore Pools and Tote Board. Samba Masala is immensely thankful for the opportunity to work with such a good cause, and we will like to extend our gratitude to both Community Chest for being such a wonderful partner and the public for their generous donations. Here is to wishing everyone a Merry, giving Christmas and a great new year ahead! Singapore Management University (SMU) Samba Masala presents: Viva o Samba! Viva o Samba! is a percussion music festival featuring an extravagant showcase of the arts, centred upon Brazilian Culture. Get ready to be blown away by an array of exhilarating performances featuring Samba Masala (SMU’s resident percussion band), Sambiesta, Bantus Capoeira Singapore, Barracuda Batucada and New Stream Brass Band. 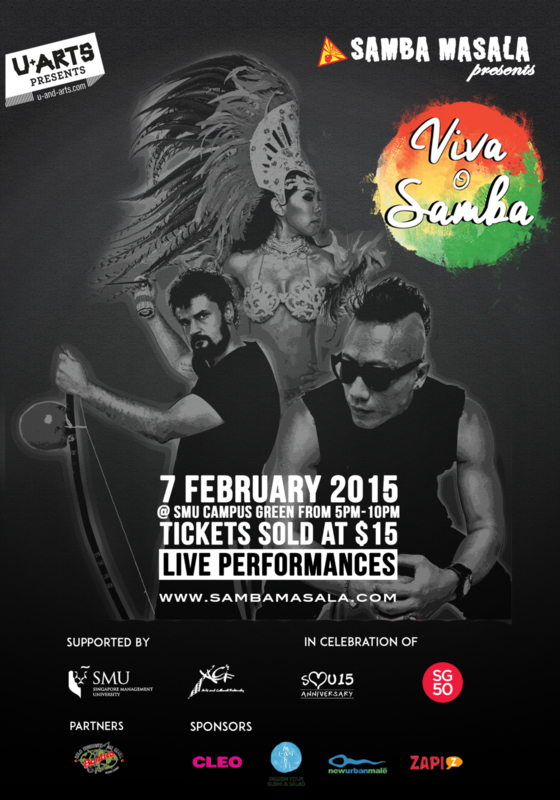 Accompanied by lots of fun, food and games, Viva o Samba is definitely the place to be. With a single ticket, you are also entitled to attend three Samba workshops conducted by Bantus Capoeira Singapore - Capoeira, Samba De Roda and Samba Reggae and Forro. These workshops will be conducted on 6th February 2015 (Friday) from 6.30pm to 10pm in De Suantio Gallery located at SMU's School of Economics and School of Social Sciences. Samba Masala is back with our annual Christmas busking! This year prepare to have a wonderful time as we bring to you more rhythm set to the festive mood for you to dance along to. For the first time ever, we would also be collaborating with Community Chest in aim of raising funds for children with special needs during this season of giving. Are those D&D parties getting a little too Dreary & Dull for your liking? Or is that colleague across the table putting you to sleep with those boring stories? Fret not and count on us to spice up the evening with a whole lot of Samba, and just the right amount of Masala. With a increasing plethora of corporations in our portfolio, it’s no wonder Samba Masala is a top choice for companies to start off their nights of lucky draws and festivities. Some names include NTUC, SPF, Association of Banks in Singapore and most recently – PepsiCo. Pizza Hut and Manulife. Needless to say, they had fun as temporary Sambistas, with our signature face paint and drums in hand. And if you’re out to have fun for the night, rest assured we’ll have it with you. We kickstarted the party at Manulife with the help of their very own employees (clad in their gladiator costumes, no less) playing a 30 second introduction that we composed for them, leading right into our set. Not only did we turn the mood up with a bang! for their movie-themed celebration, we had a ton of fun with them as well. And if there’s any special touch you’d wish to add or request from us, just ring us up and we’ll be happy to meet you to discuss it. If you would like to find out more, simply drop us an enquiry at our "CONTACT" tab and we would get back to you within two working days!